In Chinese calligraphy, the use of the brush includes the maintain of the brush that we talked about two pages above and the movement of the brush to draw the line which is the smallest unit of Chinese character. The movement of the brush, or layout, it divides into three parts: the beginning, body and termination. It is essential to know to practice Chinese calligraphy. 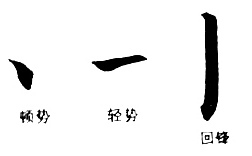 The line in Chinese calligraphy have two kind of beginning: the hidden tip and the visible tip. The hidden tip, left on the image below, must go in the opposite and slant direction of the line. As its name suggests, it hides the traces of tip of the brush. The visible tip, right on the picture, must go in a slant and same direction of the line. This is thus revealing the tip of the brush. To give the body full and loose, the pressure of the brush on paper should be more or less onerous. In Chinese it uses the image of the spring to talk about the strong effect that must be reached in this line. Chinese calligraphy are five essential terminations. The pressed termination, left on the picture below, is to press the brush on the end of the line. The raised termination, in the middle of the picture, is to raise the brush gently on the end of the line. The tip of return, right on the picture, shows the tip of the brush by coming back on his steps at the end of the line. The outgoing tip, left on the picture below, is to aggressively raise the brush at the end of the route. The blocked tip, right, require to block suddenly the movement to the termination of the line. It is very important to stress the importance of these key concepts for those who want to learn Chinese calligraphy.